The PIC18 family combines the maximum level of performance and integration with the ease-of-use of an 8-bit architecture. The material in these training modules exists elsewhere on this site in a general reference format. However, the training modules present it in an organized, step-by-step sequence to help you learn the topic from the ground up. Why is the PIC16F1619 DAC1OUT on a Curiosity board always at 0 V in debug mode? Why do I get a C syntax error on compiling a rotate left instruction asm("RLF aux, w");? Why can't I drive my MOSFET when connected to PWM? What is the resistance value of the internal weak pull-up? What is the internal protection provided by the silicon such as discharge diodes? 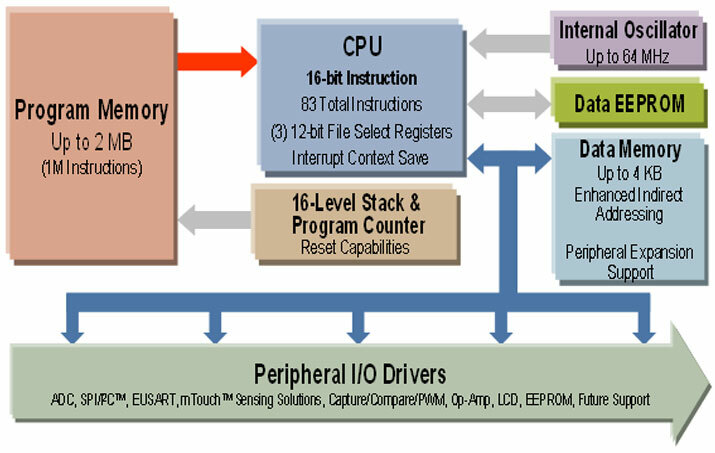 What is the instruction size of a PIC® MCU? What is Q1 on a PIC16F Comparator? What does the "-ICD" suffix on an MCU mean? What are the base PIC® microcontrollers used in the ARxxxx Series? PIC16F870/871 - What is the restart procedure after frame error (FERR) event ? Do the device pin tables show which pins are 5V tolerant? How can I create a Programmable Gain Amplifier (PGA) using an OP Amp and DAC output from a PIC® MCU? What is the difference between the Byte Endurance (ED) and the Number of Total Erase/Write Cycle before Refresh (TREF)? PIC18F87xx - How do you select the functionality of a pin? How do you read internal temperature on the PIC18F? How do I debug a Curiosity Board's PIC16F1503? How do you read the EEPROM memory of a PIC18F46J50? How can I find a pin-to-pin compatible microcontroller to migrate my project? Can the internal temperature sensor in PIC® devices measure ambient temperature? How do you calculate the sampling rate for a SAR ADC on PIC16F MCU? Can the RTCC on a PIC® MCU without a VBAT run off a battery? What is the most common problem encountered when communicating with a PIC® MCU SPI module? Can a PIC16F with USB run on the Internal Oscillator? Can the ADC measure 5 V if the VDD is 3.3 V? Can I reprogram the Oscillator Calibration on a PIC® device? Why do I need to use a unity gain amplifier to measure DAC output voltage of a PIC16F1xxx? Where can I find code examples for a PID controller using the PIC16F161x Math Accelerator? Can I connect VUSB3V3 to VDD (+3.3 V) for USB operation on the PIC16F1455? Can both UART and I²C be used on PIC12F1840 or PIC16F1829? Can CRC Be Read From A Code Protected PIC? Where can I find the ADC voltage reference? Why I can't debug with a PIC16F18877? Why does it work in release mode but not in debug mode? What are the differences among the 8-bit PIC MCU sub-families?